A few weeks ago, Bungie released an amazing new quest into the world of Destiny 2. 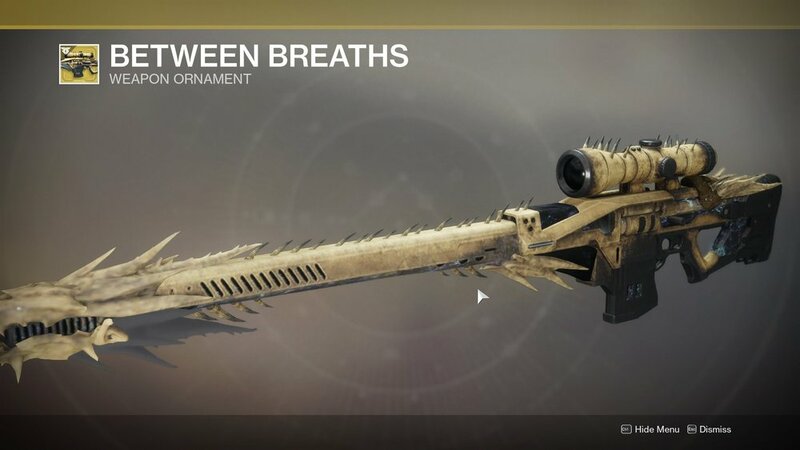 The Whisper of the Worm exotic sniper rifle was able to be obtained by completing a quest that only appears during limited times, if you "incorrectly" complete a public event in a specific area of Io. Last week I was able to finish the mission with two veteran members of my Clan. We finished the mission with only a few seconds to spare, but were able to equip another 2 members of the team with the weapon for future raids and boss fights (and just the meanest crucible snipes). A redux of the classic Black Spindle mission, and a direct reference to the Black Spindle and Black Hammer sniper rifles from Destiny 1. This new version has several premium skins and while I kind of hate supporting MTX... They're just gorgeous designs. Bound Hammer, a reference to Eris Mourn, the Hunter introduced in the Dark Below expansion of Destiny 1, who had to sacrifice her light and her own eyes to be able to escape Crota's lair. Between Breaths, a design reminiscent of bone and chitin, closer to the design of the Hive than the Taken, and the eventual subject matter of my sketch. As noted above, I decided that my painting of this weapon will be of the Between Breaths ornament variant. It's the most interesting and stylish to my eye, and I think the biggest and most interesting challenges will be to paint the lighting effects of the Taken "magic" even though they're featured somewhat less on this version of the gun. Another interesting challenge will be to capture the depth of the rifle's parts- it is somewhat easier to tell when the weapon is in motion- as your character racks the slide on the weapon and manipulates the angle that is available to actuate the lever, you can see clearly how the upper cover behind the barrel is a frame that encompasses the firing mechanism and the barrel itself. Yet another testament to the amazingness of the designers working on these models at Bungie. Below are some previews of my sketch (before I noticed that the "beard" on the "dragon's" "maw" was missing in my first sketch- you can see the updates in the preview above and the image at the bottom). Painting starts soon. Fully optimized scan of sketch on 11x17 paper. This design is amazing. I can't wait to paint it. At about 28x16", it will be slightly smaller than my other works, at least for now. I may do an even larger version- but I want to focus on creating a very unique design and getting it set up as a print like the others I had available at GuardianCon in July.